The currency of Morocco is the Moroccan dirham MAD, which is divided into 100 cents. The dirham is a closed currency, meaning it can only be traded in Morocco, so you can’t order and collect it in your home country to take to Morocco with you. It’s easy to purchase your cash in Morocco from a local bureau de change (plenty at the airports), bank or withdraw it using an ATM. Many hotels also offer this service. Exchanging money in the street is illegal however, so please avoid these unofficial schemes. It’s a good idea to keep your receipt when buying dirhams as you’ll need it to convert any remaining dirham to your local currency before you leave. Please be aware – you won’t be able to change Scottish or Northern Ireland bank notes and it‘s also very difficult to exchange travellers’ cheques. Cash is the preferred method of payment across most of Morocco as very few traders have card facilities, though larger stores, hotels and other amenities are more likely to take payments on a card, usually Visa and Mastercard (AMEX is rarely accepted). There is often a small charge to cover this service. Always try and have some small change on you – ATMs usually dispense 100 and 200 dirham notes which can be quite hard to break and aren’t much good if you just wish to pay for something small such as a coffee or a taxi ride. As with travel to any other country, please inform your bank/credit card company of your travel plans. This should avoid unexpected blocks being placed on your card. Also check whether they impose a fee for withdrawing cash or making purchases abroad so you don’t have a raft of surprise charges waiting for you when you come back! Keep a list of your card numbers and contact phone numbers for your bank separate to your wallet or purse, so if you do lose your cards you’ll know how to get in touch with your card issuer. 1) Always take your time and don’t be rushed into anything. 2) Play it cool. When you see something you want, pretend you can take it or leave it, even if your inner consumer is screaming “Buy it, buy it, buy it NOW!” If the vendor knows how much you want something they’ll have the advantage. 3) It’s a big souk, let the vendor know that you can get the same item far cheaper at a different stall. 4) Generally speaking you should go in with a bid that is a third to a half less than the merchant’s opening offer. You’ll probably get laughed at, but let that (fake) derision gird your bargaining loins and get stuck in! 5) Don’t fall for any X Factor-style sob stories. No vendor will ever sell you anything if they’re not making a profit, it’s another selling tactic. 6) As the customer you have the ultimate power – the ability to walk away. Best used as a last resort, this is something you have to commit to, there’s no going back. But if the price is wrong and the vendor isn’t shifting, it’s time to go. If they are serious about selling it to you then they will follow you across the souk and reduce the price to complete the sale. If they don’t, then all you’ve missed out on is being overcharged. As long as you’re not planning to stay more than three months then a visa isn’t necessary for British, Irish, US and Canadian citizens, just a passport that is valid for the length of your stay. (If you’re not a citizen of these countries please check with the Moroccan consulate or your government’s foreign office). Make sure you get your passport stamped when you enter Morocco or you may encounter problems when you try to leave. You’ll need to complete a landing card on your inbound flight, including details of where you are going to stay and the purpose of your trip, so it’s worth ensuring that you have this information to hand on your flight. Should you wish to stay longer than three months then you’ll need to apply for an extension, which can be done at the local police station. No additional vaccines are required to visit Morocco, though you should make sure all your routine courses and boosters are up-to-date. There are no certificate requirements under International Health Regulations (2005). There are numerous pharmacies in Morocco, though it is advised that you get a prescription from your doctor before you leave if you need regular medication. If you feel ill but don’t think it’s serious enough for a hospital, visit a pharmacist will usually be able to help you, and recommend a doctor if you need one. In an emergency the phone number for an ambulance is 15, though there are private health clinics available in the bigger cities and towns. As always, ensure you carry details of your travel insurance and any medical information with you. Labass – How are you? Kayen – Do you have? Atini – I would like. Morocco is predominantly a Muslim country (though a more socially liberated one than many others), so please be aware that some behaviour that is acceptable at home is not permitted here. Dress is usually more restrained. Miniskirts and short shorts should be avoided in public areas. Some places are more relaxed than others however, especially in coastal resorts with a strong tourist presence, but if in doubt take note of how locals are dressed and use it as a guide. Fridays are seen as a holy day so expect shops and market stalls to close around midday. And during the month of Ramadan (the dates of which change every year) you should refrain from eating, drinking or smoking in public as a mark of respect. The consumption of alcohol is forbidden in Islam but it can still be purchased in larger stores, especially in touristy areas, and in hotels and restaurants. 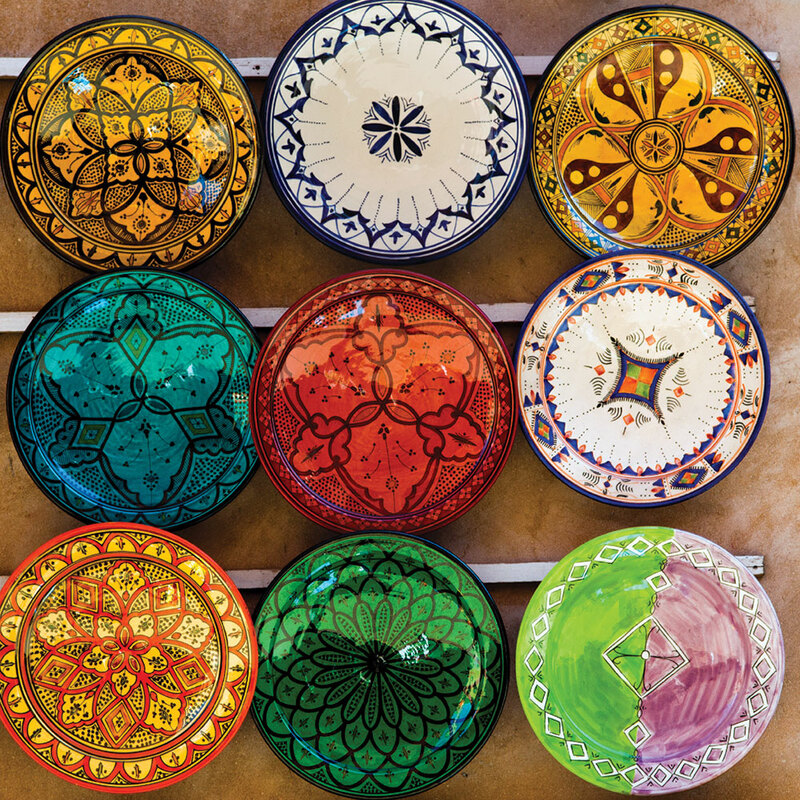 Morocco is a visual feast and it can be hard to know where to point your camera first! Landscapes are no problem as they rarely have an issue with their picture being taken. When photographing people though, it’s important to be respectful – imagine how you’d feel if strangers started to take your picture without a by-your-leave! Always ask permission first, and it helps if you get to know your subject a bit better. Moroccans are very friendly and you should have no trouble getting to know them. Power – Electricity in Morocco is 220 volts and uses the two pin socket, so you will need an adaptor to run your devices. Time – Morocco runs on GMT so jetlag isn’t a problem when travelling from the UK or Ireland. Internet – There are plenty of internet cafes in Morocco (called cybers) and many of the larger hotels and riads carry wifi. Please check with your phone provider before you access roaming data to avoid any unexpected charges. You can buy a local sim card from many shops: the Moroccan phone companies are Inwi, Orange (Ex-Meditel) and Maroc Telecom. Weights and Measures – Moroccans work on the metric system, so kilograms, litres and kilometres are the order of the day. Tipping – There are no hard and fast rules but it’s generally accepted that a 10% tip is suitable when eating out and for tour guides. Round up your taxi fare to the nearest five dirhams, but don’t feel obliged to tip if you aren’t happy with the service. Emergency Contacts – The number for the police in the city is 19, the number for the police in the countryside is 177. Medical and fire services are both reachable by dialling 15. Moroccans drive on the right, and cars are mostly manual. The major signposts (such as Stop, Give Way etc.) are the same as in Europe and when looking for directions the signs are written both in Arabic script and the Roman alphabet. Speed limits are usually 40km in the cities, 60-80km outside built up areas and 120km on the highway (this is a general guide, please always obey local traffic laws) but don’t forget this is kilometres per hour so if you’re used to judging speed in mph pay extra attention! Currently there are two toll motorways in Morocco – the Casablanca to Rabat A3 and the Rabat to Tangier A1. You’ll need your domestic driving licence to hire a car here, plus an international driving permit. The legal age for driving in Morocco is 18, but most hire firms restrict it to over 25s with at least a couple of year’s experience. It is illegal to use a mobile phone without a hands free kit while driving. It’s also law to drive with dipped headlights day and night. When approaching a railway crossing be aware that not all of them are controlled and many do not have barriers or alarms. The number for the police in the city is 19, the number for the police in the countryside is 177. Medical and fire services are both reachable on 15. Uber is illegal in Morocco.